Luigi "Gigi" D'Alessio (born 24 February 1967) is an Italian popular singer and Neapolitan singer-songwriter. In his career he has sold over 20 million records. D'Alessio was born in Naples. He was well known in Naples in the early 1990s and throughout Italy due to participation in the Sanremo Festival in 2000 and 2001. He has also made overseas appearances, the most recent was in Malta on 7 July 2012. He lives in Rome with the popular Italian singer Anna Tatangelo, who is two decades younger than him. Previously, he was married to Carmela Barbato, with whom he has three children,Claudio,Ilaria and Luca . He frequently writes and produces songs for Tatangelo, and some of the hits he had a hand in writing include "Quando due si lasciano" and "Ragazza di periferia". For Tatangelo's latest album, the couple penned the songs "Averti qui" and "Lo so che finirà" together. The couple have recorded two duets: "Un nuovo bacio" and "Il mondo è mio". They also toured the US and Canada together in October, featuring in successful concerts. He was the writer and composer of Tatangelo's song performed at Sanremo Music Festival 2008, "Il mio amico". D'Alessio achieved international success with his recent single "Un cuore malato", a duet with Belgian-Sicilian singer Lara Fabian. He also released in 2007 a version of this song half in Italian, half in Portuguese, named "Um coração apaixonado", recorded with Brazilian pop singer Wanessa Camargo. The song was included in both D'Alessio's Made in Italy Brazilian edition (replacing "Un cuore malato" with Lara Fabian) and in Camargo's 2007 Total album. In a late 2008 interview with Italian Vanity Fair, D'Alessio says that at the beginning of his career from 1992-1997 as his fame grew around Napoli, members of various Camorra clans would threaten him to sing at their parties and other festive gatherings. He would hear things like, "If you don't come and sing at my son's wedding reception, I'll cut your throat" and "If you don't sing your songs at my nephew's baptismal lunch, I'll bust your head." Some Camorra members preferred to make threats aimed at D'Alessio's nose, legs, tongue, and hands. At one point D'Alessio sang at 15 parties a day from lunch until dawn. After D'Alessio's 7 June 1997 concert at Napoli's San Paolo Stadium, he stopped singing at parties. On 4 March 2010 he debuted as a run of a television program on Rai Uno presenting his first one-man show called Gigi this is me. The first episode has an audience of 5.899 million viewers and a share of 25.04%. The sequel was released on 8 June to 6 come sei simply titled semplicemente sei early in the radio single from Vita, dedicated to his son Claudio. It also contains the song adesso basta for the campaign against bullying promoted by the city of Rome, of which D'Alessio is testimonial. Free is the second single. The December 10 public with Anna Tatangelo and Valeria Marini album 3 x te, the proceeds from sales will be donated to charity. Consisting of 6 tracks, the album once again 2 songs from D'Alessio, two of two songs sung by Tatangelo and Valeria Marini. On 14 February 2011 he performed at Radio City Music Hall in New York, the show is aired on Rai Uno on 4 and 11 March. The concert also receives the prize "United States - Italy Friendship Award" by the National Italian American Foundation. In 2012 participated in the Festival of Sanremo with the song Breathe sung in tandem with Loredana Berte. On 15 February 2012 the new album of unreleased Chiaro. ↑ "Gigi D'Alessio: cosi` cantavo per i camorristi" (in Italian). Il Mattino. 19 November 2008. Retrieved 20 November 2008. 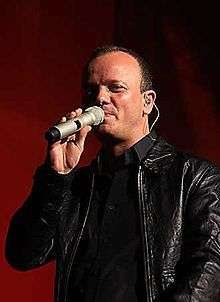 Wikimedia Commons has media related to Gigi D'Alessio.